Averi’s birthday was this past week. She is eight years old. I can’t believe she is eight years old for a couple of reasons – 1) there is no way I am mentally mature enough to have an eight year old (as I prove every time I am in the cafeteria) and 2) this means I haven’t worked in eight years (minus one year of working part time from home right before we moved to Miami). I can’t believe I have managed to go eight years without holding a job. Yeah for being a trophy wife! So, anyway, I really wanted a girl. And luckily, I was having a girl. Michael was very relieved. He had been afraid how I would react if the results showed a boy. I told him I would probably just need to cry in a dark room for a few days, and then I would move on. The pregnancy continued and we started taking birthing classes. I remember nothing from them now, but I’m assuming I found them helpful at the time. What I do remember is what happened at the final class. The teacher gave every mom-to-be a deck of cards, and explained that they had different positive birth scenarios on them – quick labor, no pain, no tearing, etc. She wanted us to lay them out to show what we considered our best case birth scenario. We did. Then she told us to flip the cards over. Surprise! The back side had the exact opposite of the other side on it (i.e., if the front side said quick labor, the back side said long labor). The teacher told us to look over our new list of worst case scenario and pick what we considered the worst of the worst. She would then have us turn in our worst of the worst, and she would work with us to come up with a game plan for how to handle it if it happened. I was the first one selected to turn in my absolute worse case scenario card. The teacher looked at it and told me she needed me to be serious and pick a new card. I told her I was completely serious, that card represented my worst case birth scenario. The card I gave her? It simply said “boy”. She said no one could control that. I told her I couldn’t control any of it – if I labored long, if I tore, if I needed a c-section. It was pretty much all out of my control. But how ever horrible those scenarios were, they would eventually end and the pain would go away and ultimately be forgotten. However, a boy was forever. I would always have the boy. And I wanted a girl. And I had been told I was having a girl. So I would be leaving the hospital with a girl. The end. That is when all the other attendees of the class pushed their chairs away from. Especially the couples who were told they were having a girl. MICHAEL pushed his chair away from me. Luckily I had a girl and the babies of the hospital were safe, and we were released in time to celebrate Averi’s first Thanksgiving. 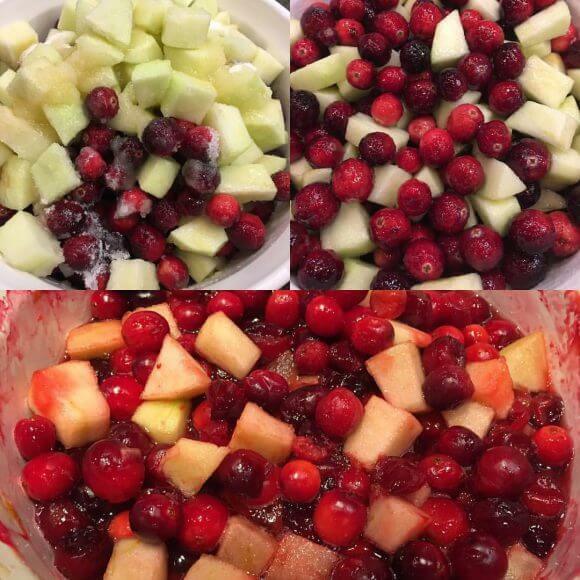 Which means turkey, stuffing, mashed potatoes, and our favorite cranberries. This recipe is awesome because not only is it easy to make, but it can be served hot or cold, so it will always work perfectly for whatever your needs are. I don’t have a picture of it yet, because no matter how delicious it is, I will not be cooking it now, just to get you a picture. Plus I don’t have the apples, and you need them. It is rare for me to say this, but don’t substitute are replace any ingredients. The combo of cranberries, apples and orange juice gives this dish a nice tart flavor, complemented by the sweetness from the sugar. No matter how traditional you make the rest of your dishes, having this cranberry dish will make you seem fancy/edgy/great chef. If you make it and notice that I haven’t replaced my pic yet with a finished cranberry dish, feel free to send me a picture of yours. In a large baking pan combine all the ingredients. Toss, making sure the cranberries and apples are thoroughly coated in the liquids and sugar. Cover with foil and bake until fruit is soft, approximately 40 minutes. Remove from oven and stir.